Anatoly Georgievich Aleksin, was a Russian writer and poet. Richard Basciano was an American property developer active in New York City and Philadelphia. Katy Bødtger was a Danish singer. John Bahen was a former Australian rules footballer for the Fitzroy Football Club in the Victorian Football League (VFL), playing 67 games between 1962–67. In retirement he went on to own a number of city hotels including The Greyhound Hotel, The Imperial and The Station Hotel NM. Bahen died on 2 May 2017, aged 73. The Fitzroy Football Club, nicknamed the Lions or the Roys, is an Australian rules football club formed in 1883 to represent the inner-Melbourne suburb of Fitzroy, Victoria and was a foundation member club of the Victorian Football League on its inception in 1897. The club experienced some early success in the league and was the first club to win a VFL Grand Final. It also achieved a total of eight VFL premierships between 1898 and 1944, and more recently three VAFA promotions in 2009, 2012 and 2018. The Makkah Region or Mecca Region is the most populous region (minṭaqah) in Saudi Arabia. It is located in western Saudi Arabia, and has an extended coastline. It has an area of 153,128 km², and a population of 8,557,766. Its capital is Mecca, the holiest city in Islam, and its largest city is Jeddah, which is also Saudi Arabia's main port city. The third major city is Taif. This region also contains Rabigh, roughly the present-day area where the Islamic Nabî Muhammad gave his famous sermon at the event of Ghadir Khumm. The Ministry of Defense, a ministry in Saudi Arabia that is responsible for the protection of the national security, interests and sovereignty of the country from the external threats as well as the working with all ministries of the state to achieve national security and stability. The current minister of defense is Prince Mohammad bin Salman who was appointed on 23 January 2015. The Ministry includes four armed forces; The Royal Saudi Land Forces (RSLF) ,The Royal Saudi Air Forces (RSAF), The Royal Saudi Naval Forces, The Royal Saudi Air Defense Forces (RSADF). Joseph Barnes was an Irish physician and medical missionary who worked in leper colonies in West Africa in the 1940s. Most notably, he co-founded International Community for the Relief of Suffering and Starvation (ICROSS) with Michael Elmore-Meegan. Anthonius Hubertus "Bart" Carlier was a Dutch football player. He played eight seasons in France, winning league championships with AS Monaco in 1961 and 1963. Carlier appeared for the Dutch national team five times, scoring two goals. Clive Colin Brooks was a drummer, best known for his work in the English progressive rock band Egg. The Groundhogs are a British rock band founded in late 1963, that toured extensively in the 1960s, achieved prominence in the early 1970s and continued sporadically into the 21st century. Tony McPhee is the sole constant member of the group, which has gone through many personnel changes but usually records and performs as a power trio. ↑ Bishop Barry Alexander Anthony Wood, O.M.I. ↑ Dr. William Ames "Bill" Davis Jr.
↑ "Voice lost, veteran radio broadcaster Satsorupavathy Nathan passes away". Nation.lk. Retrieved 15 November 2017. ↑ Bishop Amancio Escapa Aparicio, O.C.D. ↑ Former Wesfarmers visionary dies aged 92, The West Australian, 8 May 2017. ↑ Obituary: Hugh Thomas, author of seminal book on the Spanish Civil War. ↑ Dr. Huub van der Aa passed away. ↑ Archbishop Brian James Barnes, O.F.M. ↑ Governor Walker Lowers Alaska Flags in Honor of Fmr. 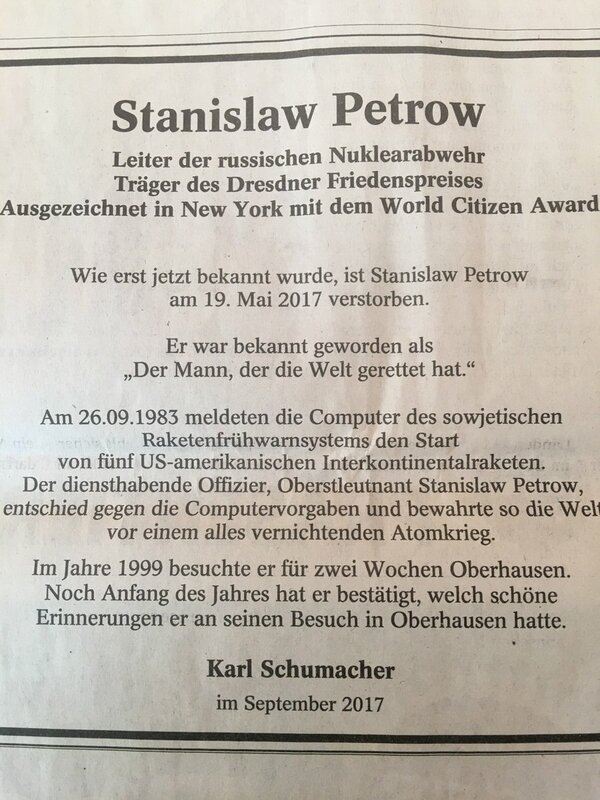 Judge Seaborn J. Buckalew, Jr.
↑ Nancy Oestreich Lurie, Ph.D.
↑ In Memory Of David Alexander Ramey, Sr.
↑ Obituary in the Westdeutsche Allgemeine Zeitung (WAZ), Oberhausen issue, September 9 2017 (accessed September 15 2017). ↑ GIROUARD, Gérard, B.A, LL.L. ↑ "Popular Sri Lankan motor racing legend passes away". Newsfirst.lk. Retrieved 20 November 2017. ↑ Archbishop José Carlos Melo, C.M.